Do desktop search tools spell the end of grep? Tools such as grep, find and awk have often come to the rescue of gleeful Bashmongers searching for files buried beneath gigabytes of other items. But when a typical Linux distro takes up a couple of gigs of disk space, it's not hard to imagine that finding your files will only become trickier over time. Compared with their internet brethren, today's desktop search tools can be used not only to look for the names of files on your disk, but can also perform context-sensitive searches within email archives, images, videos and music. Some tools take it a bit further and even index your browser history and bookmarks. Desktop search tools work by creating an index of all the files on your system. When you search for a file, instead of looking through the entire disk, the tools only search the index. Since the reason for the existence of desktop search tools is to enable you to find files faster and more conveniently than conventional tools such as find and grep, they need to be fast and reliable, and offer as much information as possible to help you identify items. Most tools can therefore read the metadata on files, provide you with an excerpt from text documents, show you the resolution of images (along with a thumbnail) and provide other details for each file. Stemming – which means that, for example, if you search for 'beat' the tool will also match 'Beatles', 'deadbeat' and so on – is standard. Convenient graphical interfaces are a common feature of most desktop search tools, but many also come with a suite of command line applications to help you index and search your system for files. Installation hiccups and large memory footprints are no concern for the desktop search tools in our list, with 512MB RAM sufficing for most of them. Since the size of the index grows with the number of files, you want a tool that can find items quickly and accurately. So, how vague can you be and still end up with the file you want? And, on the other hand, how much information can you fill in to be as specific as possible? Can you use wildcards? Bonus points go to any tool that keeps the size of the index small and offers numerous search options, such as limiting the search to certain MIME types. 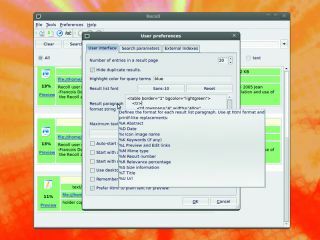 Features such as stemming, reading metadata, reporting on exotic formats and searching text within files make for a great tool.